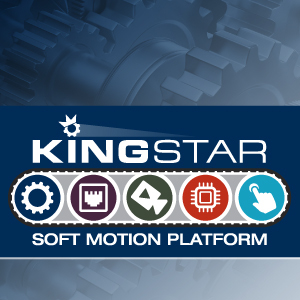 The KINGSTAR Soft Motion Platform is an open and standards-based integrated platform that enables motion control and machine vision engineers to design, develop and integrate motor control applications with KINGSTAR’s soft motion library and software PLC. Built on the foundation of EtherCAT and a real-time 64-bit Windows operating system, it provides a complete platform for motion control and automation engineering. KINGSTAR products consist of pre-tested, pre-integrated software components that are critical for assembling a Windows-based, EtherCAT-enabled machine control for equipment that requires motion or position control. Customers build the sequence of machine-specific commands, submit the commands to the motion control algorithms via an API, and tailor a Human Machine Interface (HMI) in order to complete the process of building a full-function PC-based machine controller. The rest of the infrastructure: real-time motion control algorithms, the EtherCAT Master, communications protocols, and servo configurations are automatically handled by the KingStar Framework. Engineers work exclusively in Windows in the "Open Loop" process and submit one or more commands to the motion kernel API, which handles the rest of the "Closed Loop" processing.